At Bing Ads, we continually strive to deliver solutions that make you more effective at achieving your marketing goals. For this reason we’re constantly reviewing feedback that you, our clients, have shared on our UserVoice feature suggestion forum, and using these ideas to improve our product. Read on to learn more about the specifics of the areas called out above. Whether you are an agency managing a diverse client portfolio, an advertiser being managed by agencies or managing multiple accounts yourself, we understand that you have unique needs. You are time constrained and are looking for ways to manage your accounts more effectively and efficiently. In the first half of 2018, we launched the following capabilities that are globally available to help you with this. 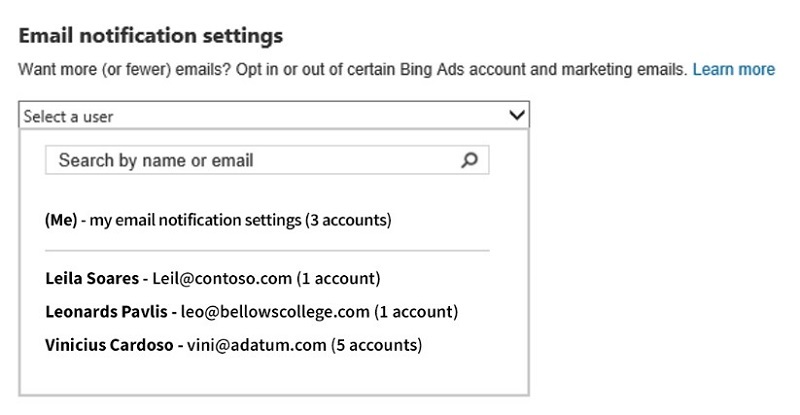 Instead of managing multiple logins to access different sets of accounts with Bing Ads, you can now access multiple accounts with a single login. We have added a search capability in the selector, so you can quickly find the different sets of accounts to view and manage. 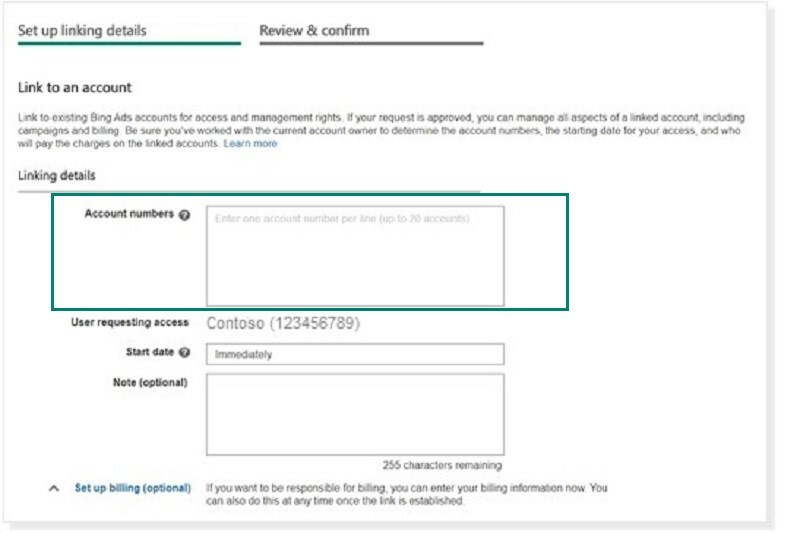 To simplify accessing multiple accounts, we are adding a bulk experience that will allow you to request access to multiple accounts as well as take over billing for these accounts. And you can handle requests to link to your accounts in bulk. The link requests in the grid now also include the billing details for a billing takeover request, so that both the sender and the receiver can easily refer to it. Every account needs to have a primary contact. We now support bulk management of primary contacts, to make it easier for you, as you change who has access to different accounts. We have simplified inviting and managing users with access to your accounts with several improvements. When creating a new account, you can now also select as primary contact, any Standard user with access to current and future accounts. The Users tab provides several new capabilities, like quick alphabetically sorted views with additional information including the last date the user signed in, and the ability to export users with their roles and the accounts they have access to. We also help you ensure your accounts have the right primary contact at all times, by not allowing the last SuperAdmin to be deleted and by providing an actionable error message that lets you change the primary contact on accounts you are removing a primary contact from. With different users managing different accounts, we know you care about ensuring the right notifications go to the right users at the right time. Our email notification preferences now enable users to manage their own notification preferences for accounts they have access to. Additionally, SuperAdmins can manage this for all other users. Granular controls enable you to easily opt in and out of specific categories of notifications for specific accounts. Finally, we have added a link to these email notification settings, in the footer of all emails you get from us, so that you can easily manage your preferences. If you are managing multiple accounts on a credit line, you need to maintain insertion orders for each of them. With our bulk insertion order capability, you can now create and update insertion orders in bulk through import and export. You can choose to export all the fields from the grid or only specific fields required for the subsequent import. Manage hundreds of IOs in minutes. The insertion order grid also has new capabilities for search, column selection and filtering to make it easier for you to manage hundreds of IOs. You can now also print the electronic insertion orders directly from the Web UI, inclusive of the Terms and Conditions. Agencies can access their clients’ invoices, even when their clients are paying the bills. If you are using the same payment method for multiple accounts, we are rolling out the capability to associate this in bulk. Running performance reports and then optimizing campaigns based on the results is one of the most important recurring tasks of the search engine marketer. We’ve made improvements to two key reporting experiences, thanks to your feedback. Dimensions tab improvements - changes include adding a column selector to customize the grid, filters for easier management, new reporting such as age and gender, geographic and time quarter, and other new reporting metrics such as return on ad spend, revenue and other. This is globally available. New settings grids were released for location targeting, ad schedule targeting, and device targeting which allow you to manage your targeting in bulk and shows you performance metrics inline. This is globally available. In addition to providing new performance reporting experiences, we also improved our data retention policies so share of voice data is now kept for two years instead of 6 months. Formerly known as Annotations, Automated Extensions save advertisers time by using artificial intelligence to analyze large amounts of data and find more effective ways to supplement text ads with extensions for improved visibility and increased performance, with no action required from you. With this relaunch of automated extensions, we have addressed the most frequent related customer request and added performance reporting and the ability to opt-out of automated extensions. This is globally available. Additionally, earlier this year we introduced price extensions to allow advertisers to augment text ads with the ability to showcase products and services along with price information. These will currently serve in United States, United Kingdom, Canada, France, Germany, and Australia on PC and mobile devices. All remaining markets will be coming soon. Helping you connect to the people that matter is our highest priority. We continue to improve audience targeting capabilities and are excited about in-market audiences which enables you to quickly reach consumers who are ready to buy. Using artificial intelligence (AI), Microsoft is able to predict and identify audience segments who’ve shown purchase intent signals within certain categories. These will currently serve in United States only. 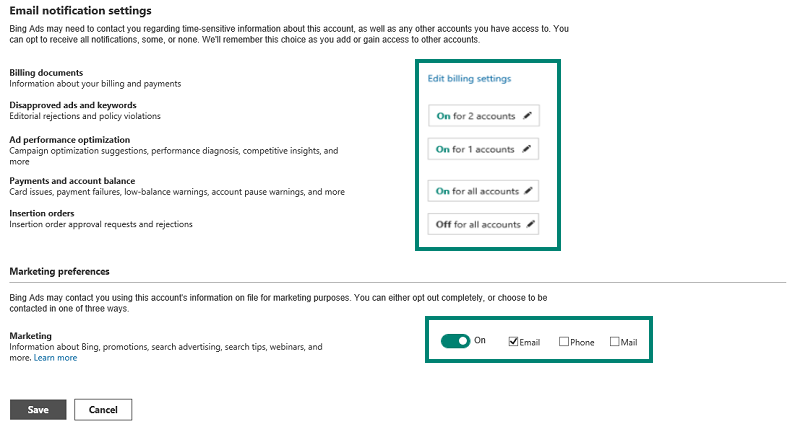 We believe that you should be able to choose how to pay for your ad charges with Bing Ads and not have to worry about billing once you’ve set it up. We’ve made several improvements to continue to reduce friction here, in direct response to your feedback. You can now use prepaid cards to prepay for your ad charges. We are also expanding our PayPal support, so that you can use it for your accounts with CAD, EUR, GBP, MXN and NOK currencies. We have made it easier for you to protect your accounts from getting paused due to billing issues. If you are using a credit card to pay for your ad charges, and you have a failed payment, you will get an email notification from which you can update your payment method and avoid having your account going on hold due to a second failed payment. Additionally, to avoid your account immediately going on hold, we will provide a warning if you are attempting to use an SAP ID that doesn’t have a credit line assigned yet. This way, if your payment method does go on hold due to failed payments, once you settle the outstanding payment, the payment method will be cleared for use again. This is globally available. 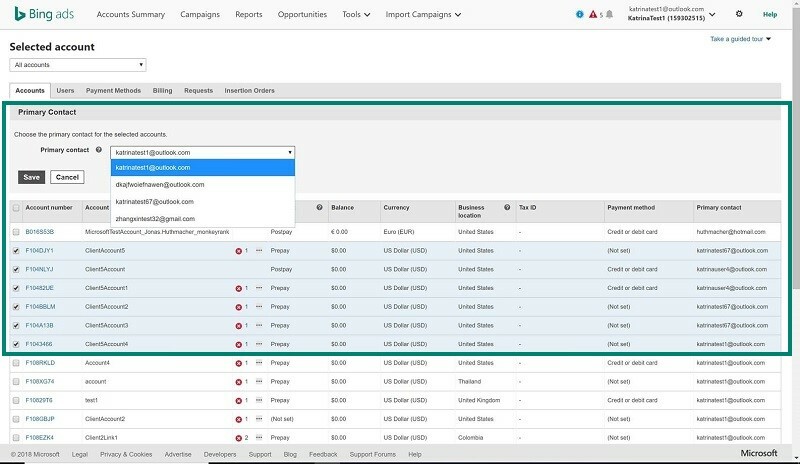 Save time by reducing the need to maintain two separate feeds for Bing Ads and Google AdWords. Import product offers more easily from GMC to Bing Merchant Center (BMC). Keep product offers fresher across both platforms through scheduled importing of the feeds in BMC. % Products Targeted: Based on the total products submitted the percentage of products that are being bid upon in the product group. 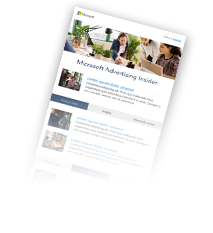 Thank you for being a valued Bing Ads client and for providing us these and other great suggestions on how to improve Bing Ads to meet your marketing goals. We look forward to listening to more of your suggestions in our UserVoice feature suggestion forum and plan to share another round of product improvements based on your feedback in our next update.